What Andrea_Briz did not tell you about her trip to Hawaii was that the true highlight, outside of getting smiled at by Ian Anthony Dale, was getting to meet with a fellow fangirl: me. Live and in person. Let’s back up a minute, shall we? I have never been involved in a fandom before I joined the ranks of those who love Hawaii Five-0. Well, OK, so I was pretty devoted to Buffy back in the day, but “tweeting” about an episode involved getting on the telephone (remember those?) with a friend and either watching simultaneously or calling right after it ended to gush. Later, once I discovered that Tom and Lorenzo were recapping Project Runway and analyzing the costumes on Mad Men, I became smitten with the idea that the internets could really enhance my watching of TV. I was watching Hawaii Five-0 and having , well, feeeelings. I needed people to talk to; there was just too much to look at, talk about and laugh at! Then I found Sardonic (Maha is Preeeteee!). There they were: my people. They were funny, smart and really liked the show. After reading just a few recaps, I aspired to FUCUPhood. As an extrovert, I assumed it would be OK to just start commenting and joking, but as a former high school nerd, old feelings of insecurity crept up. While the jury is still out on whether I am cool enough to be a proper FUCUP, I barged right in and started watching Hawaii Five-0 with friends: friends from all over the world, friends who love Alex O’Loughlin and who also care about the characters, friends who have rapier wits and, frankly, lots of time on their hands. As much as I have enjoyed these new friends, though, it occurred to me what an odd kind of friendship it is. Why? Some of them I only know by WordPress or Twitter handle. Most of whom I have no idea what they look like, what they do for a living, or how they worship or play. It’s weird, you know? Because of Hawaii Five-0, I know people, and yet don’t really know them. But then I found out that the Champ Box’s own Andrea_Briz was going to be in Hawaii at the same time my family was going to be there. Oh sh/t! This provided an existential fandom dilemma. Should we meet in person? Should we let Real Life and Fan Life cross over? If I suggest it will I be perceived to be a stalker? Will she want to make her holiday all about H50? What the hell. I went for it. After some DMs, that led to emails, we discovered that not only would we be on Oahu at the same time, but we would be staying in roughly the same part of the island. Our local beaches were on the same bay, for crying out loud. It was meant to be. 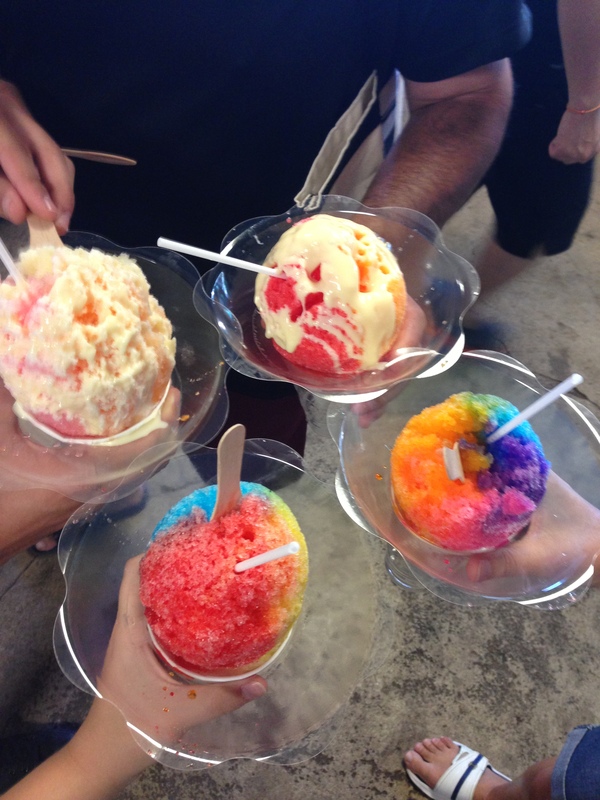 In the spirit of our beloved Show, we decided to meet for shave ice on the North Shore. Laden with gifts from my hometown, dragging NotMcG and JuniorSage along, I arrived at the shave ice place strangely nervous but pretty excited. (Would we find anything to talk about? Would our families die from embarrassment? Could, by the force of sheer want, make Steve and Danno appear?) And there, in the parking lot was Andrea_Briz and her beautiful family. We talked for a long time about things we loved—Hawaii Five-0, baseball, shopping—right there in the parking lot, before we even ventured to the shave ice counter. And ever after, it was like that. We could always find something to talk about. We prolonged our time together by walking around Haleiwa, and Andrea and I talked, while the spouses and kids made small talk. 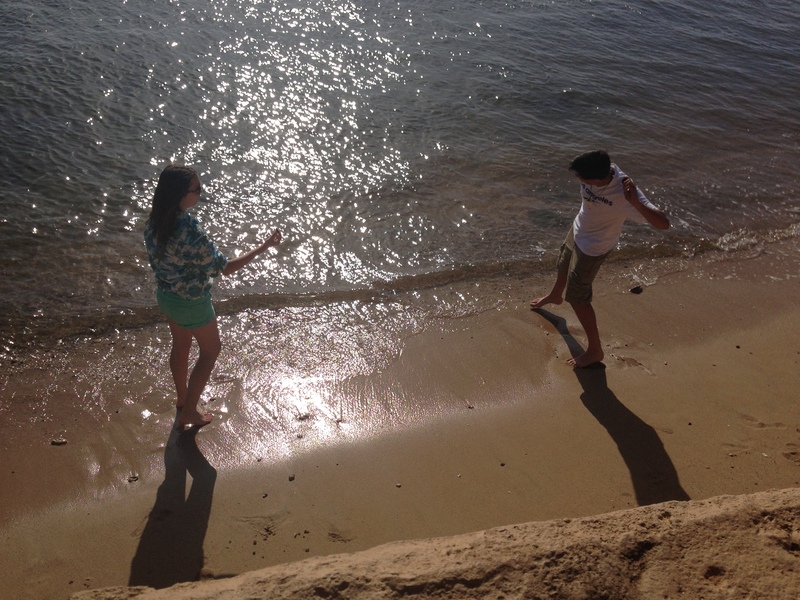 After dragging everyone around for a couple of hours, we decided to move to a beach park so we could keep talking, and they could all play. But they didn’t go and play, actually. The teenagers hung around, as if what we were talking about was actually interesting, and the spouses, despite, perhaps, a little annoyance at having to take time from swimming and hiking to talk about TV, actually seemed to get along. It turns out that Andrea_Briz is thoroughly wonderful. She is generous and smart, earnest and kind. We talked about loving Alex O’Loughlin and loving the show. 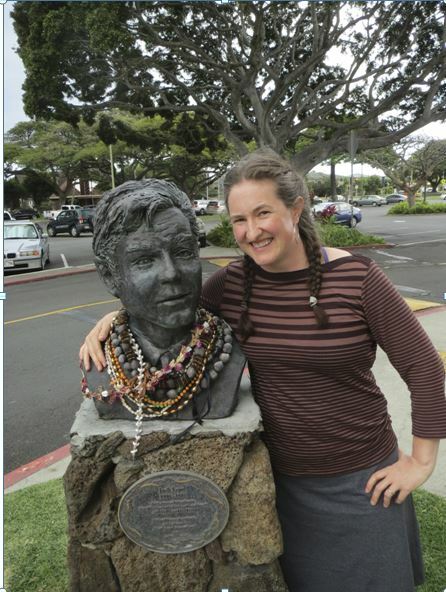 We talked about Danny—because, you know, I love him—and finding filming locations around Oahu. We discussed blog maintenance and the fact the Twitter is odd, especially when multiple time zones are involved. We also talked about how Show didn’t seem to be quite as great as it used to be and yet not wanting to give up on it because of the community we suddenly found ourselves amidst. And suddenly we found ourselves able to talk about non H50 topics –gasp!—like education in our respective countries, and raising kids, and baseball, in all its glory. There came a point at which my 3-and-a-half year-old son needed to get bundled in the car and home for dinner, so without even a question, we made plans to meet again. That dessert date was also wonderful, and again we managed to talk about every subject under sun, including thornier topics like immigration and politics, which we discussed with grace and humor. We even managed to talk a little about her son’s first heartbreak, much to his chagrin, I expect, and through it all, we managed to close the restaurant down. It was only when they started stacking chairs that we realized it might be time for us to go. I will now always have a place to stay in Brisbane and at least two teenagers think I am kind of cool. Oh! And I have a lovely new mate. Thanks, Briz! Thanks to fangirlsage for sharing her fangirl story. Thanks also to our mega-tolerant families for indulging us not once, but twice! So McG and Danno did not magically appear out of the crowd. But we shared an amazing experience and it was very special that it happened in Hawaii. In Hawaii! For me, the barriers of geographic distance and ‘virtual’ friendship don’t seem as great now. Best of all, I had the chance to meet a fair dinkum bonza Sheila, all thanks to Hawaii 50. I didn’t know you guys were there at the same time. Thats cool that you got to meet up and it wasn’t super awkward like a blind date from hell set up by match.com. Kudos. Gee, you’re fast, chickie! Thanks so much for the kudos, really appreciate it. Nope, no match.com action. I think our NotMcGs would not have been amused. He’ll, they were barely amused as it was. Good fun was had and, did I mention, Briz and McBriz are raising cool kids, so not only is she my Aussie slang expert, I will now be going to her for parenting advice. I think she will revoke my designation as a mate pretty quick, here. D says your tattoo is ‘pretty hectic’ too, by the way. Sage, thanks for sharing with us. How exciting that you got to meet each other – you both look so happy in that last pic! 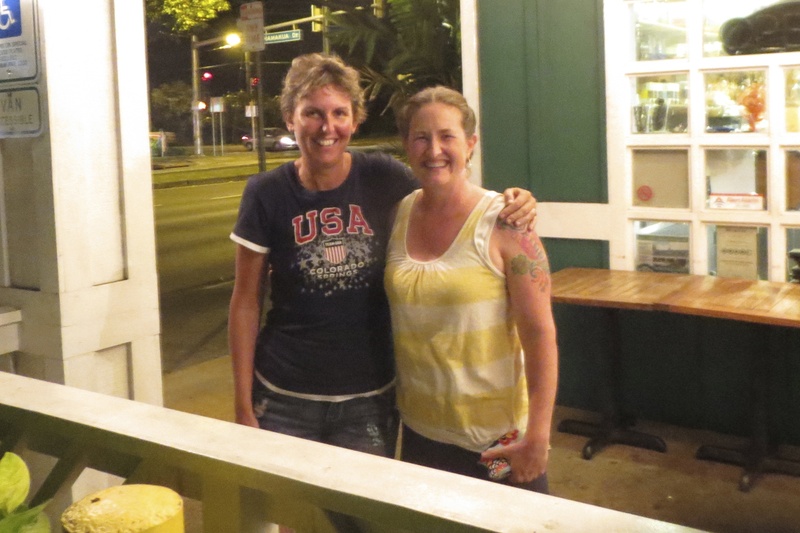 Can’t wait for the day when we can all meet up in Hawaii…it WILL happen! I will *never* say no to a trip to Hawaii, so I’m there. (I’m not sure I could pass up a trip to Oz, come to think of it… ). We do look rather happy in the second picture, don’t we? We had such a great night although I’ve still got loads more to say. Next time! Thanks, Westy, for letting us take over the Champ Box. This is about the most amazing personal story that I have read on any blog. Though I don’t know either of you, neither virtually nor really, of course, your story appeals to me a lot. I’m glad you decided to share it – thank you for it!! Awwww! Thanks for stopping by and reading Sage’s story. Thanks, Marnov! What a lovely thing to say! I absolutely love the story, and that you took that step to actually reach out and make the contact and follow through. It would be a total chance of a blind date from hell and would give new meaning to an awkward chick flick moment with emphasis on the awkward! Glad it worked out and that you shared it with us. I also understand the insecurity of posting on the Sardonic site. Such a great group of funny and insightful ladies to keep up with, its intimidating. I figure anytime you get two moms together conversation will certainly flow from there. I know Brisbane is hometown to Andrea, where is hometown to sage? What a lovely comment, CVC! It was a great risk, but I must say that Briz’ comments led me to believe we would be simpatico. I didn’t realize how much kids and politics and education wold link us. That was just lucky. And my hometown? A wee town three hours north of San Francisco, CA. This is such a lovely story! The internet IS odd for those of us who grew up without it, like having a hundred penpals at once but not having to wait three weeks between letters. It’s wonderful that you were able to meet up. Really, the fact that I have new (and not skeezy) friends from all over the world is the promise of the internet fulfilled. But I have no doubt it could have gone south. Luckily, Briz is a lovely person though and through. That helped. You two met in Hawaii?!?!? SO COOL! What an awesome coincidence that you were there at the same time. I’ll happily meet up with anyone of you in Hawaii… if I could only get to Hawaii! Yeah. We were hella lucky. McBriz and McSage are pretty awesome, just to tolerate our crazy schemes, so maybe it isn’t such a surprise that they got on. Thanks for the lovely comment! That is so wonderful! How exciting to meet a fellow fan! I don’t know if I could be that brave, since I’m an introvert. Not to steer the topic to me, but I was the same as you. Never really involved in a fandom before this. I had no idea there was so much stuff on the internet until I started looking up a few things about Mad Men! That was kind of fun, but then I got totally hooked on H50 and began obsessing over it, so I did a lot of web searching and found lots of wonderful people! I got into tumblr and LiveJournal, though. I didn’t know about sardonic until a few days ago. 😦 I started writing my blog on LJ a couple of years ago and whoosh–I’m totally in the fandom now! Just got on twitter less than a year ago and here on WP a few weeks ago. 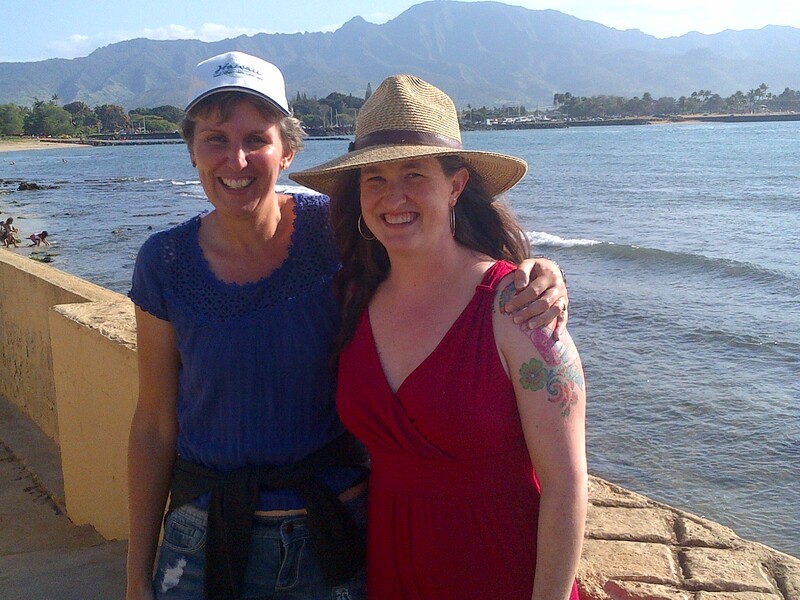 Thanks for sharing your story of meeting in Hawaii! That’s so wonderful! I did dip my toes into tumblr and all the rest, but it got a little overwhelming. I think I am going to stick with Sardonic, Twitter and WordPress for now…I could really see myself sucked into hours of screen time if I don’t draw a line. I wonder what it is about the H50 experience that draws us in? I’m convinced it is the bromance and ohana stuff, but I know others would say it is AOL himself. What say you? It’s fantastic that you two met up. I missed you both by a couple of weeks. 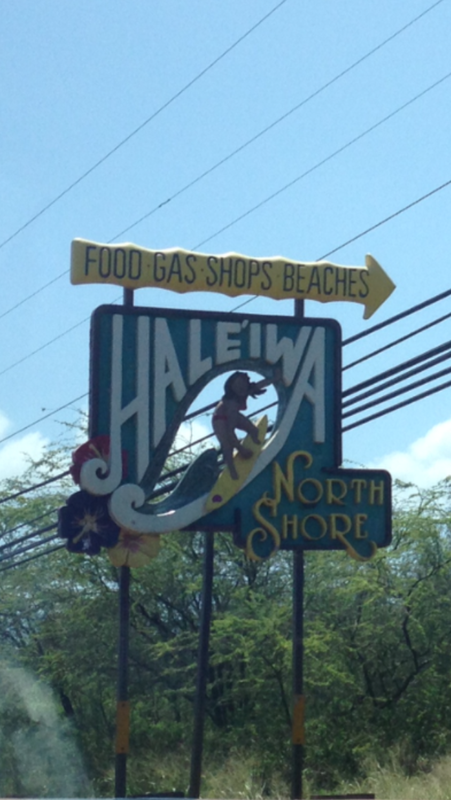 We got off the bus at Haliewa. 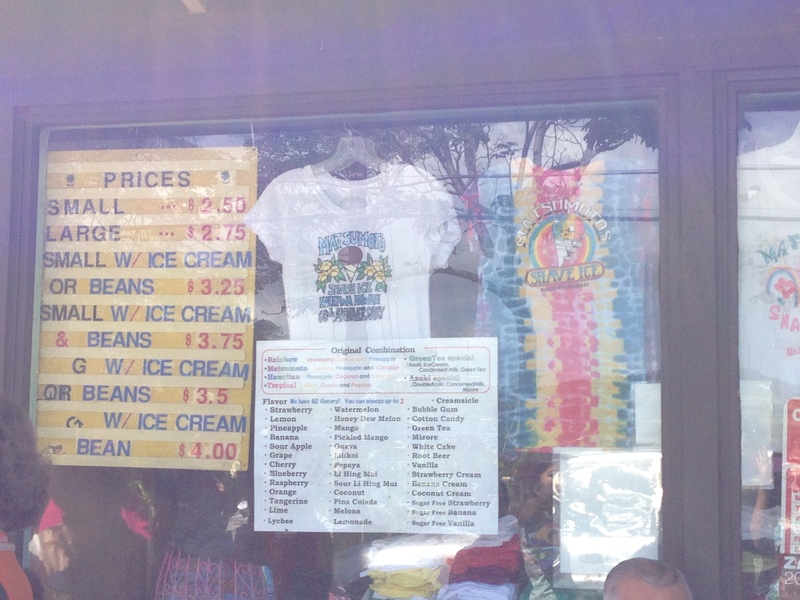 Went in the shave ice shop but too full from a big breakfast! I think it’s lovely that a few of us are meeting up. Crumpet’s next on my list! Such a shame we weren’t all in Hawaii at the same time!